Quantum physicists tell us that we are all connected to one another. That’s a big concept to get your head around. How on Earth can everyone and everything in the universe be connected? From a scientific standpoint, I can’t explain it. From a spiritual perspective, it’s a little easier to feel the concept. We are all a part of All That Is. The “stuff” that makes our bodies and that makes the tiniest grain of sand on the beach has at its source the energy of All That Is. Call it what you like: God, source energy, Chi, Prana. That energy seeds the universe and everything in it, including you and me. Although we are all a part of this great energy family, we are also individuals. No one else has your body, your thoughts, your likes, your abilities or your beliefs. 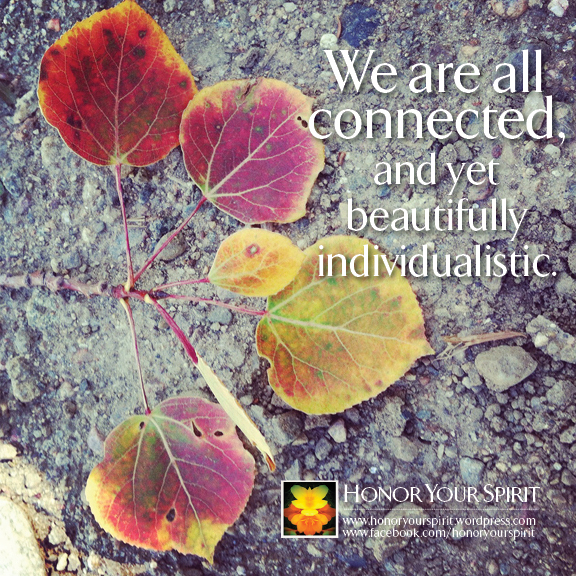 Each of us is a magnificent bundle of individual traits that bring to the world a unique perspective. I try to remember these two points as I navigate my daily life. By remembering that we’re all connected, I remind myself to be kinder to others. I remind myself to limit my judgment of others. Harming another is, in effect, harming myself; so, remembering my connection to others helps keep me mindful of my thoughts, words and actions. Likewise, I try to remember my own beautiful individuality. No one else can do the things that I can do. No one else looks at the world just the way I do. When I remember that, I start to get a glimpse of the way I affect the world simply by being me. I knew better: never check a work email at 5:30 p.m. on a Friday after you’ve left the office. Don’t check it especially if it’s from someone whom you know will cause your blood to boil. The email was from a coworker on a small project we had been working on for several months. I knew it would probably contain bad news but I couldn’t help myself and opened it anyway. True to form, in three sentences, I was belittled, insulted and turned down on a simple request. Knowing there wasn’t much I could do, I tried to put the email out of my mind and I grabbed the dog to take a walk. Walking usually clears my head and makes me feel better, so I was eager to step out into fall air. But after several blocks, I realized I was caught in viscous thought-pattern. I was not only re-reading the email in my mind, I was thinking of all of the ways I could respond to it in writing, or in person, or in some other imaginary way. None of them were good. I realized this woman was not worth my time and energy any longer. This issue was trivial and not worth getting upset over. Both of these were little things and they didn’t deserve any of the valuable real estate of my conscious thoughts. I had ruminated about the situation enough; now was the time to stop. It wasn’t easy at first. I had to mentally force myself to think about other things. I took note of the color of the fall sky. I looked at the changing leaves of the trees. I knelt down and gave my dog a big hug and petted him for a few minutes. Every time my thoughts would drift back to the woman and the situation, I reminded myself that they were not going to ruin a perfectly good Friday evening. 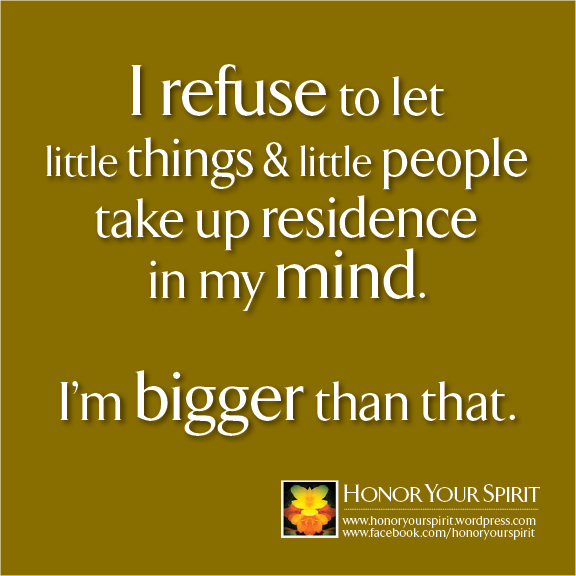 Little people and little issues don’t deserve to take up residence in my mind. That’s the thing about learning and applying conscious creation–once you know better, you have plenty of opportunities to put new thoughts and actions into practice. It takes time to do this. When you accept the fact that you are in control of your life, you must be purposeful in your approach. You must be conscious enough and selective enough to determine where you put your mental focus. By the end of my walk, I had forgotten about the email. I trained my thoughts away from it and onto more important matters, like thinking about the fun weekend ahead. When I did remember the email later in the weekend, it had lost its grip on my ego and my conscious thoughts and I was able to think about it without a lot of attached baggage. Don’t let the little things get you down and don’t let the petty people around you dissuade you from your dreams. You’re bigger and smarter than that. This is more than an affirmation: it’s a commitment to creating safety, protection and grace within yourself that shapes the world in new and miraculous ways. Every fall, we are faced with questions about our own safety. The terrorist attacks of Sept. 11 are an annual reminder of the dangers that lurk in our world. But, it doesn’t have to be that way. Our world starts within, created fresh each moment from our own personal thoughts, feelings, beliefs and expectations. It’s very easy to forget that and get caught up in the dangerous world. It’s easy to watch the news, read a newspaper or talk to a co-worker about the dangers in our world. Terrorists, global warming, crime, and violence seem to be everywhere; they are everywhere when you go looking for them. As you seek them out, you’ll find them and when you do, you feel terrified of all of the things you must guard against. It’s time to take a step back and look at our lives from a different perspective. It’s time to remember that each of us are responsible for our own thoughts of safety, peace and protection. It’s time to remember that our lives are blessed simply because we choose to be on this magnificent Earth at this particular time. Beyond the affirmation, you must attune your attention to those things that remind you of your grace, safety and protection. You look for them and seek them out. When you find them, you take the time to acknowledge them and thank yourself for noticing. Signs of our own grace are everywhere, from a beautiful sunrise to a laughing child to a delicious dessert. Likewise, signs of our own safety are everywhere. It’s in the coincidences that keep us out of harm’s way and the continued well being that surrounds us each moment. 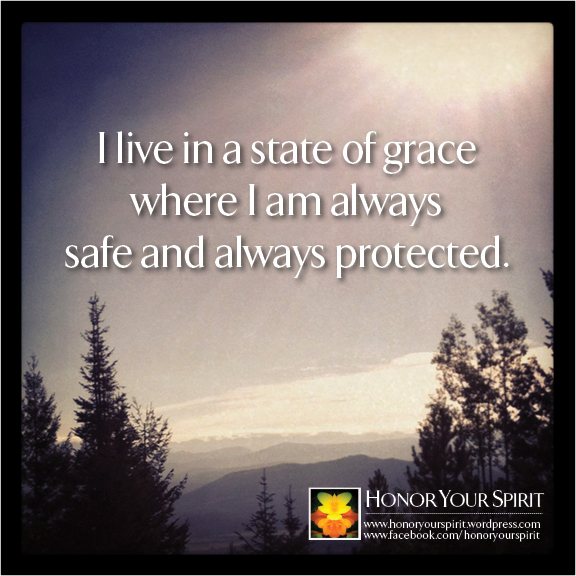 I urge you to Honor Your Spirit by taking a moment today to remind yourself of your safety, remind yourself of your protection and remind yourself of the soft cast of grace that surrounds you. When you do, you are actually creating a more peaceful world and what could be better than that? The Aspen tree is a perfect example of positive change. Each year as the tree prepares for winter dormancy, its leaves turn a dazzling display of different shades of gold, red, orange and purple. The tree itself is stressed enough to drop its leaves so that it can direct its growth from the inside and emerge bigger and stronger in the spring. 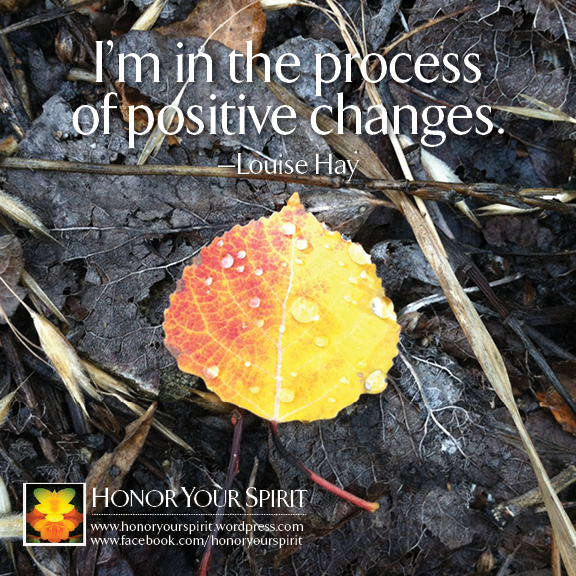 That affirmation from the beautiful and inspirational Louise Hay has been in my head constantly these past few weeks. Like many others, I’ve been experiencing a lot of change that has hit all at once. At times, that change feels like more than I can handle. And during these times of extreme change, it’s hard to maintain a positive attitude. In fact, it’s downright impossible some days. When faced with extreme changes, affirmations can be a saving grace. Some people love and resonate with affirmations; others do not. I’ve had mixed results with them over the years but am reminded of their importance as I navigate these hard changes. Affirmations are starting points–they are designed to wake you up and help you take notice of where you are now and where you are headed. They serve as a reminder of the way life can be if you’ll only take notice and adjust your thinking. Ultimately, change is good. Remember that and affirm it. You might not believe it or be conscious of it in this moment, but change is positive. Change is growth. With growth comes new opportunities, so seize change and allow it. Remind yourself over and over that you will come out in a much better place even if you can’t see it right now. Take a scheduled time each day to repeat a few affirmations quietly. Relax your body, focus your mind, tell yourself that for the next several minutes you will suspend judgment and allow yourself to believe the words you’re about to say. Say them in your mind, say them out loud, or shout them to the universe if you feel inspired. Spend just a few moments doing this at a time that works for you. Throughout the day when you catch yourself feeling on edge, anxious or stressed, stop what you’re doing, close your eyes for a moment and repeat an affirmation that reminds you of where you want to be. Pick words that address how you’re feeling and reframe those emotions to more positive ones. Just saying this internally a few times can help adjust your thinking and emotions on a small scale. Sometimes all you need is a little push in a new and different direction to help reduce your stress and remind you of how great you are.